Submitted by sbk on Mon, 2011-04-18 06:03. What about 3d max 2010 support? Submitted by Marius Silaghi on Mon, 2011-04-18 00:13. Maybe it is, but I want a cooler name. I'm thinking more along the lines like "SubD Resurrect" Or "TurboRestore" or "SubD Reconstruct" or "SubD Restore". If you or anybody else has some name suggestion I would welcome them. Submitted by sbk on Sun, 2011-04-17 23:43. So guys what do you say if I make an TurboReduce modifier?Sounds great, hah? Submitted by Marius Silaghi on Sun, 2011-04-17 19:32.
hi everybody, I officially changed the name of the script to TurboReduce like the TurboSmooth modifier. I released version 1.2 which is 100 times faster than 1.1. You can get it here http://www.scriptspot.com/3ds-max/scripts/turboreduce. Right now I'm looking into the SDK and trying to master it. When I have the modifier ready, everything will be instantly, no more waiting, c++ is dam fast. Submitted by vbn on Fri, 2011-04-15 15:16. Very useful script but unfortunately acts unpredictably. On some meshes it works, on others an error message pops up. I am getting "compile error: no outer local variable references permitted here elements" on some meshes. I am using Max 2011 SP1, hotfix 4. Submitted by br0t on Fri, 2011-04-15 01:17. Submitted by fael099 on Mon, 2011-04-11 18:35.
this is really a nice script, but lets say you make a box, and then apply 3 levels of turbosmooth. (or how many you want) and then collapse to mesh. 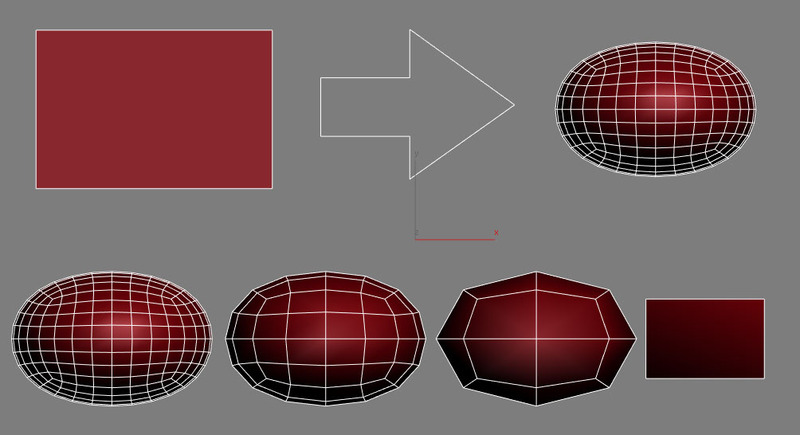 if you apply the script over that mesh, it will result a much smaller box than the original. thats because apparently, it wont average the size, it will only create a new unsubdivided mesh fit inside the current dubdivided mesh. is it possible to make it average the size? perhaps on future releases? Submitted by secondplace on Wed, 2011-04-06 11:08. SIL i don't think what you are trying to do is possible since the original modell is not a quad bassed sub division modell. Submitted by mad on Tue, 2011-04-05 22:52. Submitted by kiki_hu on Tue, 2011-04-05 15:55. “compile error: no outer local variable references permitted here elements?"